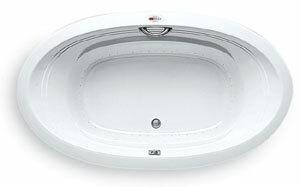 The Jason Designer VL5535 whirlpool bath tub features clean lines and a modern minimalist design. This spa bathtub has flowing armrests and lower lumbar support. Both VL model jacuzii baths comfortably hold two bathers. The VL5535 is also deal for under mount installation. Call 800-720-1062 for more details. 42" x 72" x 20.5"
Jason AirMasseur baths offer a more subtle, full-body hydromassage by surrounding your body with millions of warm-air bubbles. They are equipped with Jason's special channel-type construction of air jet holes around the bath's lower perimeter. STANDARD EDITION: Includes a 1 HP variable speed blower with air heater and electronic control with 20-minute timer and automatic purge cycle. Controller operates blower speed for continuous or pulse massage mode. SIGNATURE EDITION: Includes a 1 HP variable speed blower with air heater and digital control with 20-minute timer and automatic purge cycle. Controller operates blower speed for continuous, pulse or wave massage mode. Control also operates a 20-minute timer, auto-purge cycle and shows blower speed and time remaining. Includes LED mood light and floating Universal Remote Control. SIGNATURE EDITION: Includes a 1.5 HP, 3-speed pump, 1 HP variable speed air blower with air heater, and a front access LED mood light. Digital Controller with low water level and water temperature sensors, 20-minute timer, and an automatic purge cycle. Controller also operates the 3-speed pump, air blower, air blower heater, blower speed and continuous, pulse or wave massage mode. Shows water temperature and time remaining. Includes a floating Universal Remote Control. Jason Designer Collection soaking baths are available in a full selection of sizes and shapes. The bath includes a Level Form? base for ease of installation and reduced heat loss. Options include acrylic grip handles and metal drain overflow assembly in polished chrome, bright brass, brushed nickel and gold. This tub is available as an air tub. This tub is available as a soaker. Jason Air Tubs provide AirMasseur Hydrotherapy. What is an AirMasseur bath? An AirMasseur bath generates millions of warm air bubbles that enter the bath through strategically spaced holes in the bottom radius of the bath. Imagine lying back in a bath of bubbly champagne, the feathery touch of the bubbles reach just below your skin's surface for a delicate full-body massage. Jason International was founded by Remo Jacuzzi and his family. Jason sells the full line of whirlpool tubs and offers advanced technology like MicroSilk® and AirMasseur® whirlpool and air systems in their hydrotherapy baths which has helped people enjoy healthier lifestyles since 1982. The Jacuzzi family heritage ensures well trained hydrotherapy experts that engineer whirlpool tubs that deliver the most rewarding bathing experience; for the mind, body and spirit. Combining expertise in relaxation with the science of hydrotherapy, Jason brings you a complete bathing experience. It is part of healthy living, a luxurious link in your body’s daily cycle of natural healing.